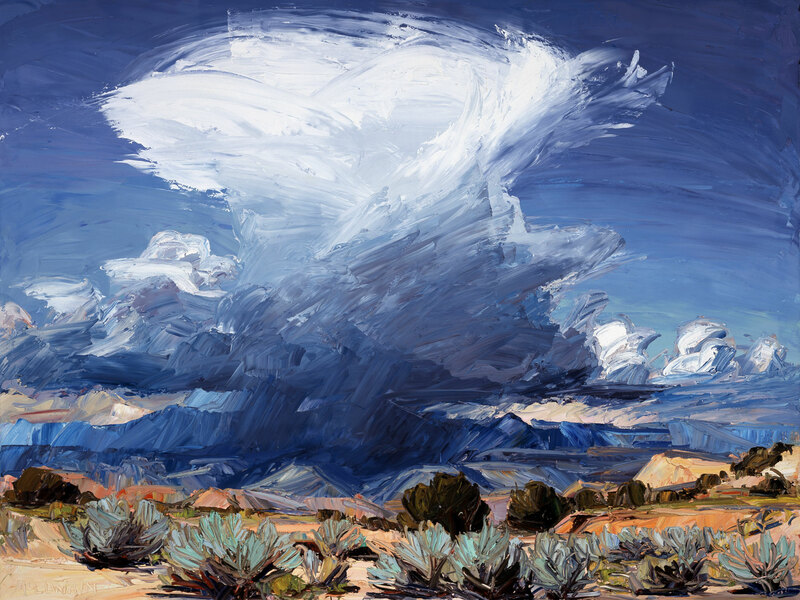 EVOKE Contemporary unveils paintings done from 1972 to 2012 by Louisa McElwain. The show is scheduled to open in Santa Fe on Friday, August 2nd and will run through Saturday, August 31, 2013. A painting, for me, is the sum of innumerable commitments to an idea made in a dance to the tempo of the evolving day. It is a kind of 'captured choreography' beheld in a single gaze. Louisa McElwain, 1953 - 2013, was a renowned New Mexico painter famous not only for her thickly impasted landscape paintings of the Southwest, but also her larger than life personality and adventurous, joyful soul. 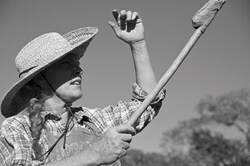 Louisa lived fully with an extraordinary view and zest for life, which was unrivaled and contagious. Internationally recognized as a master painter, Louisa was a highly creative, intellectual mind, fully immersed in her spirituality, a great humanitarian, a self-sufficient gardener and ranch woman with immense compassion for her animals and the land. Her presence was like the summer storms she painted - always a vivacious and refreshing surprise. She accurately dubbed herself an “extreme painter”. Her bliss and fulfillment came to her when she was painting. She frequently shared the stories of the power of nature pulsating through her body when she was one with her environment, and her astonishment of the paintings that resulted. The intense passion in which Louisa painted crossed over to all areas in her life; she was a bright burning flame that went out at her prime and the peak of her career. Her marks are not only found on her canvases, but on the hearts of each of us that knew her. Do not miss this exhibition of paintings spanning 40 years of Louisa McElwain’s life. EVOKE Contemporary is committed to promoting compelling and provocative contemporary artists of international acclaim. EVOKE Contemporary participates in First Friday Openings + Artwalks in the Downtown Arts + Museum District each month year round. EVOKE Contemporary is located at 130 Lincoln Avenue, Santa Fe, New Mexico 87501.